She was preparing the public for the Russian narrative plot she had been working on with Fusion GPS and dossier author Christopher Steele. FBI Director James Comey told lawmakers Monday that his agency has been investigating possible coordination between the Trump campaign and Russian officials since last July. Shortly after the FBI launched a probe into Trump-Russia connections, Hillary Clinton mysteriously started tweeted about Trump-Russia connections. Hillary got desperate in October as the election came down to the wire and she was STILL waiting for the dossier to be released to the public. On October 31st, 2016 with just days to go until election day, David Corn of Mother Jones broke the story of a ‘veteran spy’ who gave the FBI information on Trump’s alleged connections to Russia. Christopher Steele, British spy and author of the garbage dossier was not named in this Mother Jones report. Only hints of the dossier were published; the salacious claims were omitted. Hillary Clinton was disappointed the entire dossier hadn’t been published in full prior to the election. After all, she paid millions of dollars for the smear document. “I have an outlier here that connects to Russia in a strange way,” he wrote in his notes. He couldn’t quite figure it out at first. But what he saw was a bank in Moscow that kept irregularly pinging a server registered to the Trump Organization on Fifth Avenue. A week later, Hillary Clinton and the Democrats were in utter shock when Trump won the presidential election. Desperate to delegitimatize him, BuzzFeed published the entire dossier on January 10th, right before the inauguration. 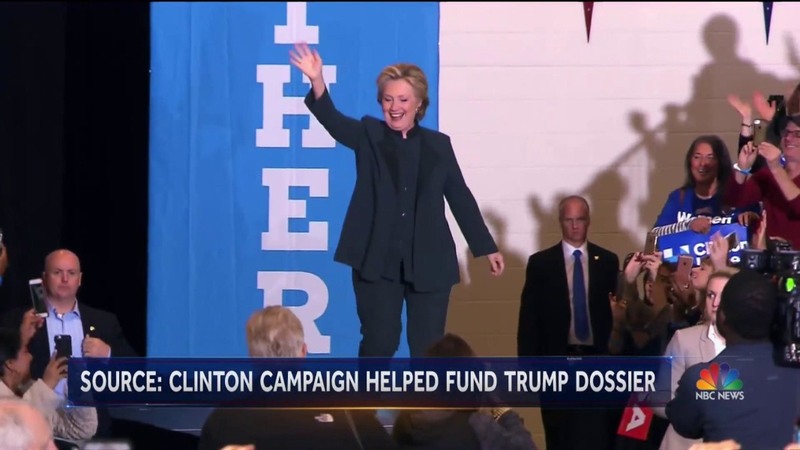 The DNC and Hillary Clinton herself are now trying to claim they knew nothing about the dossier even though WaPo dropped a bombshell this week confirming Hillary’s campaign and the DNC paid for the 35-page document. Hillary Clinton went the entire election without tweeting about ‘Trump-Russia’ until the wheels were turning behind the scenes with Christopher Steele and the Russia dossier. The ‘Trump-Russia’ tweets in August through election week shows she was anticipating the release of this dossier. It never came due to no substantial proof..
2 desperate tweets in October!